So a few weeks ago, I decided that I needed to replace my reading glasses… then I looked closely at Conner’s glasses and decided he needed new ones too. In fact, I decided we were both over-due for eye check-ups as well. Conveniently, most LensCrafters stores have eye doctors right next door and they work together to make sure you have a really positive experience, so I booked our appointments and in we went. 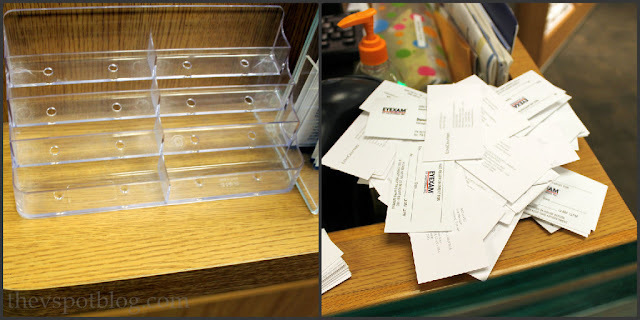 Can I just say that the very first thing I did was knock over a display of business cards that were sorted and holding cards for about 8 different people…. You seriously cannot take me anywhere. Conner thought it was hilarious. The super nice store manager, Terry, assured me that it was no big deal, and got both of us started on our eye exams. As you can see, Conner’s current glasses were pretty thrashed. I am pretty sure they have broken his fall a few times while he’s been skateboarding or playing basketball or something. 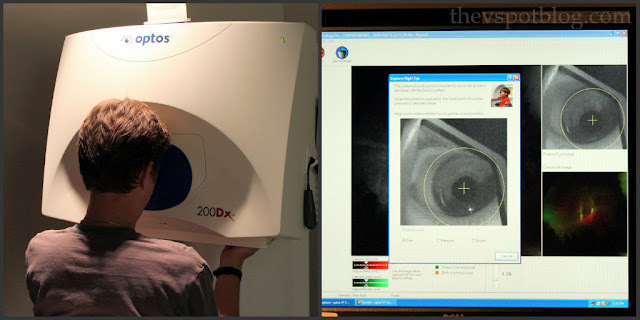 We had the basic eye exam, but I went ahead and paid a little bit more to get retinal scans for us too. This machine can basically see the back of your eye and can give insight into your overall health, as well as the health of your eyes in general. I think this is fascinating… In this collage, the large picture on the left is my eye. Healthy, fortunately. See those red spots in the top right picture? That indicates high blood pressure. The black and white photo in the middle… see that white thumbprint shaped blob? That person has breast cancer. And the smoky, fan shaped thing on the bottom right indicates sickle cell anemia. If the eyes are the windows to the soul, they are also the windows to your overall health. Apparently, if there is something wrong, it will show up in an eye exam pretty early. I’ll be getting one annually from here on out. After our exams, Conner and I spent some time trying out lots of different frames. When we narrowed it down to just a few contenders, we were able to use LensCrafters’ Virtual Mirror to see how the glasses look on, and easily compare which we liked the best. It was so helpful. Conner had narrowed his choices down to two pairs and he and Terry talked through the pros and cons. Once he decided on which pair he wanted, then they measured them to fit. No one’s face (or ears) are perfectly symmetrical. My left ear is for sure a bit higher than my right, so my glasses always sit a little lopsided. LensCrafters’ AccufitSM Digital Measurement system takes all that lopsidedness into account for the specific pair of glasses that you chose. 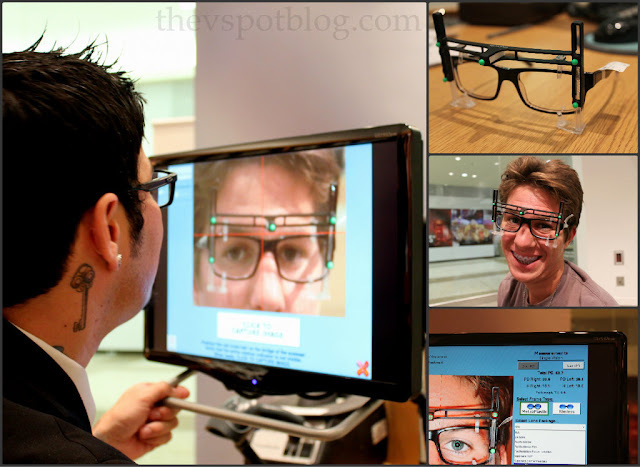 This wacky little measuring device hooks onto the frames you chose and they take digital images that show them how much to adjust the lenses, the frames, whatever they need to adjust to have them fit your face and give you the clearest vision. It’s incredibly accurate… Like down to the millimeter, accurate. (Very good news for those of us with lopsided ears.) By the way, this system is complimentary and is only available at LensCrafters. Conner is super happy with his glasses. They are much more current and a bit more “grown up” than his old pair. I also went ahead and got him sunglasses too, since he is going to be driving soon. I definitely want to make sure he has great vision for that. I am loving the frames I picked out as well. Much, much better than the bad, blue librarian frames I had previously. LensCrafters offers a clearly different optical experience by helping you find your perfect pair of eyeglasses that allows you to see 5x clearer. 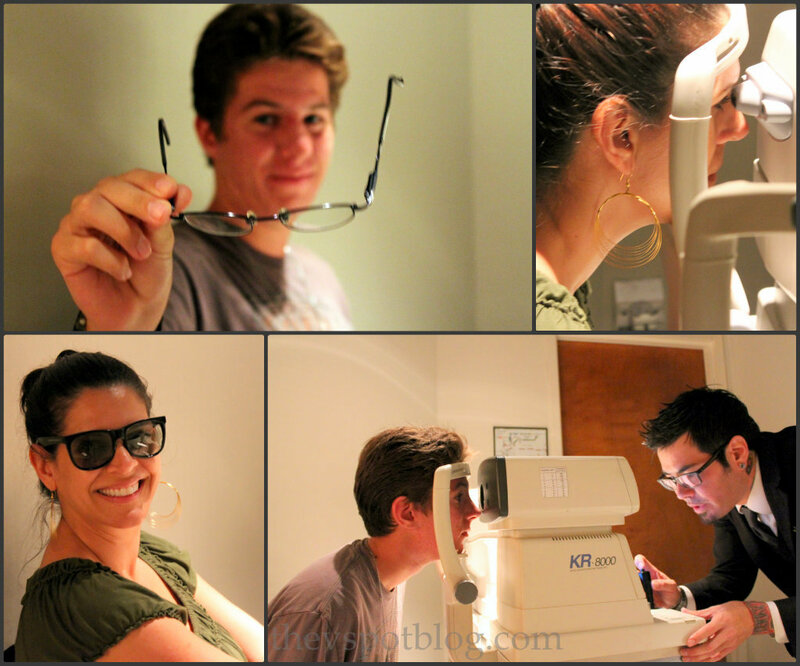 When’s the last time you had your eyes checked? What you dont know is that business cars is actually a test. They stamp your file “super blind” if you knock it over! When we were in Cali, we used LensCraters and were always very happy with the service and products! What a good sport Conner is. And yes, those boys are hard on their glasses! Great post Viv! Where is the pic of you in your new frames?? We wanna see!! Wow, that is amazing that they can see other things in your eye– I have never seen a picture of mine. I had lasik and I can imagine I’ll be looking into some glasses in the coming years to be able to read your blog but glad to see technology is advancing! Very cool! I totally need to do this. My eyesight is getting a bit dim!!! Great information. Thanks! This is cool! 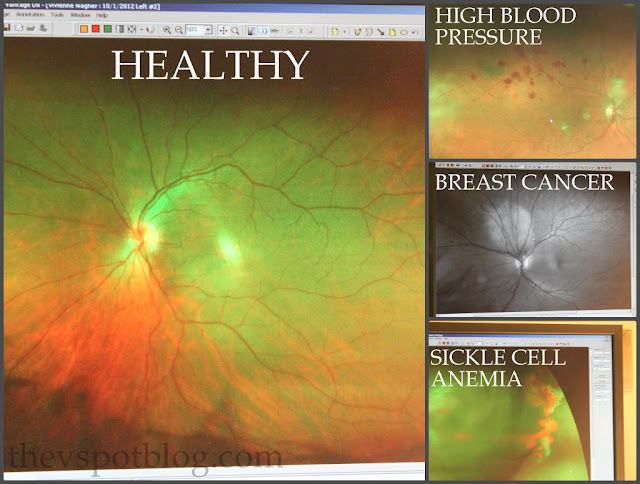 I love that you can detect diseases through the eyes. I always thought it would be cool to be an opthamolagist. Except that I remembered I can’t spell opthamolagist. I really need new glasses. Ok – so I should have had the super duper eye scan done!! I am definitely doing that next time! !